Lets skip the intro, I'm lazy and I'm already running kind of late. 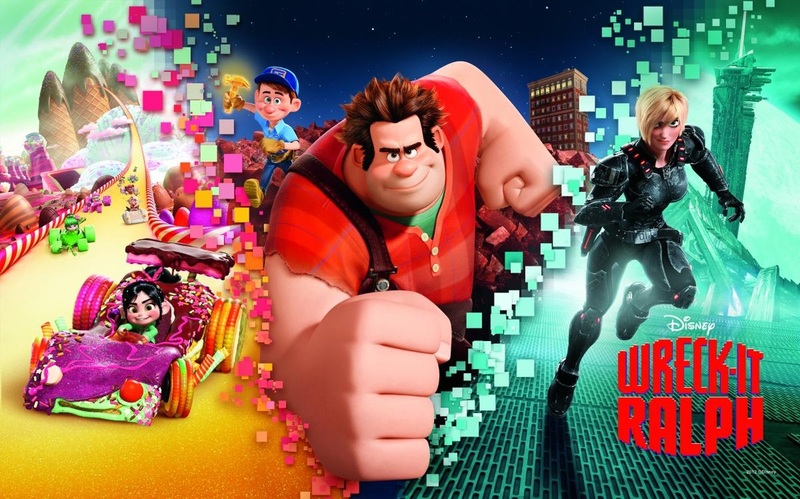 It's Wreck It Ralph! Now, lets face it, we all know what its about, or you wouldn't click here. So, lets start out with the characters. First, there's Ralph, from the real life video game Fix It Felix. I like him, he's a good protagonist and I do really feel for him through the film. Some may find this character done but I think he has plenty of juice left to keep this machine functioning. There's also Vanellope (Excuse me if I spelt it wrong) Von Sweetz, a glitch to her home game Sugar Rush. I also like her, she's a believable child, and I like how she interacts with Ralph. Fix It Felix is the standard good guy, and I like him. He's a good character, but the only flaw about him is that he has an unnecessary romance with the captain of Hero's Duty, Sergeant Calhoun. She's a good character, but like I pointed out, that romance is kind of unnecessary to the plot. Though it does lead to a funny joke about her backstory. The King of Sugar Rush is a funny guy, and probably one of my favorite characters in the movie. That's all the characters that are really important. Don't expect a lot of classic video game characters, it isn't like Roger Rabbit when they are scattered through out. They're really only in there for the first 20 minutes. I know a lot of you are expecting to see Sonic, but he only has one line in the movie, and it's exposition. Speaking of which, the plot is decent in ideas but has a lot of plot holes. I might make another post in the Specials Section listing all the plot holes I dug out of the movie, but that doesn't mean it's bad. Getting the audience to feel is more important than being accurate in these kinds of movies. Also, like I said, I expected a little more game jumping, or at least a little more video game interaction like Roger Rabbit, but I also have to remember it isn't Roger Rabbit. It's Disney's own personal take on the video game genre and I respect it for that. The animation has to be one of the best of this year. The colors are out there and vibrant, the textures are brilliant, the character designs fit well to the game the characters are from, the movement accurately portrays something you'd see from a video game, the animation is great. I can't point out anything wrong with that part. The moral is also fresh, and it's a good breath of air. Now, my overall thoughts. Plot - 73/100 Plot holes aside, it's a wonderful feel good and fun plot. Characters - 83/100 The characters that are there are all wonderful, but sometimes you don't see enough of them or you don't see enough of the classic video game characters. I kind of wanted to see Disney's take on them, instead of just putting them in cameos. Seriously, Mario isn't even in there! Animation - 92/100 Might be too cartoony for some, but I think it works in certain atmospheres of the games. Moral - 70/100 It may have been done before but the "Be proud of who you are" and "Medals don't mean you're a good guy" are presented really well.